Unobstructed close-up view of Mount Shasta, Trinity Alps, Castle Crags, Black Butte (a small cinder cone mountain adjacent to Mount Shasta near the town), Town of McCloud, Pit River Basin, Hatchet Ridge (with many windmills on it), Redding, Shasta Bali, & many other notable features. Also, you drive right passed the aqua colored glacial waters of McCloud Reservoir (good fishing). You only get a good view if you can see Mt. Shasta from a fair distance away. If it’s socked in with clouds, you might want to choose another day for this adventure. 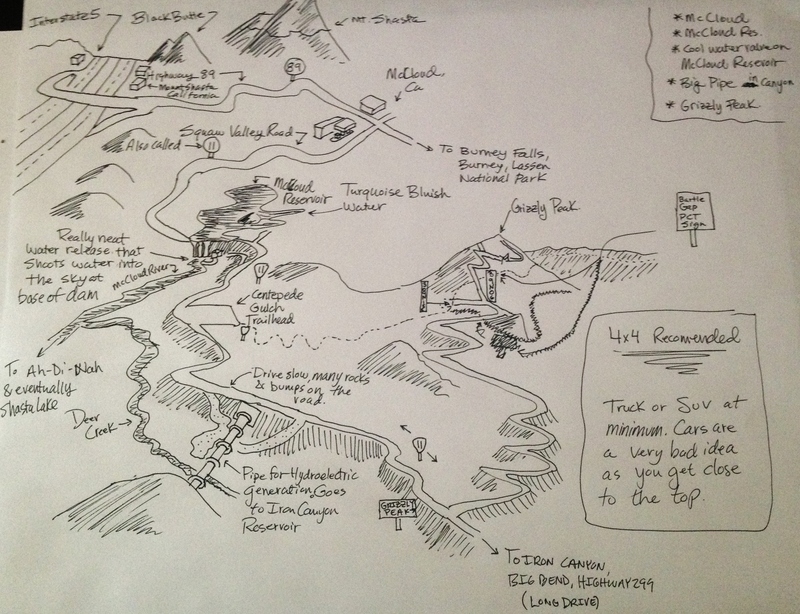 2 ways to get to the top, Hiking part of the Pacific Crest Trail or Driving 200-300ft shy of the peak. Driving: Best to go in a truck or SUV with moderate clearance as the roads have a few dips/bumps that a car may not cross over. 4×4 highly recommended at least for the last section of road. Hiking Path: Centipede Gulch Trailhead. Proceed to GPS location 41.117325, -122.058472. GPS Directions: It’s a little more complicated than typing in the final GPS coordinates. If you simply place in the final GPS coordinates, it’ll route you the wrong direction through private property and a locked no-trespassing gate. Not recommended. To get there, you must have a mapping software that allows multiple destinations & then input 2 sets of GPS coordinates to get yourself there. The first set is to the Centipede Gulch Trail for the start of the hiking option: 41.117325, -122.058472. If driving, then type in the coordinates to the final destination 41.144599, -121.979142. The apple mapping app doesn’t do multiple destinations very well. From Mount Shasta,Travel south approximately 12 miles on Highway 89. In the town of McCloud, make a right turn on Squaw Valley Road (it’s the one with the Chevron Gas Station, can’t miss it). Travel down Squaw Valley Road, staying on the main road as it travels down to and around McCloud Lake. As you cross over the McCloud Lake Dam, make a right turn. The road becomes dirt & very bumpy. Watch out for rocks. Approximately 1 mile down the road, there is a big parking lot with a trailhead at the backside of it. For the hiking option, this is where you start the trail. If driving, continue on the road a few miles (6 miles or so). You will come to a fork in the road with a sign saying Grizzly Peak Road. Take a left turn and travel approximately another 6 miles to the peak. Look out for rocks, bumps in the road, and deep puddles you can get stuck in. After a big storm, there is a possibility of trees falling across the road. If you can’t move the log, rock, etc out of the road safely, you can hike up the main road towards the peak. keep hiking upwards and you will get up there. It’s gorgeous. When you’re up there you may have cell service. Grab a selfie & then reverse your GPS course (before you loose all cell coverage). Maps: Note that there is limited cell coverage in the area. Verizon works intermittently. Buy the Shasta-Trinity Map @ any Northern California USDA Forest Service Ranger Station. The closest Gas Station is in McCloud.